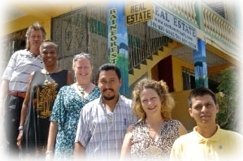 Building in Belize, or in many other 3rd world countries, there are not many (if any) building codes to abide by. This lack of regulations gives you freedom, but it also brings disadvantages as labor, such as plumbers and electricians, do not have to be certified, therefore anybody can (and do) claim to be anything they want. Problems may not necessarily arise due to a lack of knowledge, but they will sometimes due to carelessness and ‘don’t give a damn’ attitude. This article covers many areas involved in the building process; Plumbing, Electrical & Wiring, Roof, Gutter & Down Pipes, Concrete Work , Clearing the Land, Burning, Daily Inspection, Tools & Equipment, Paying the Workers & Contractors, Hardwood House Coating. This post was getting quite long, so I divided it into 2 parts. As best I could, I listed each point in order of the building progression. CLEARING THE LAND ~ There will be clearing to do, how much depends on where you’re building. In the jungle, it is a very important factor as the forest is very lush and dense due to the sub-tropical rainforest climate. 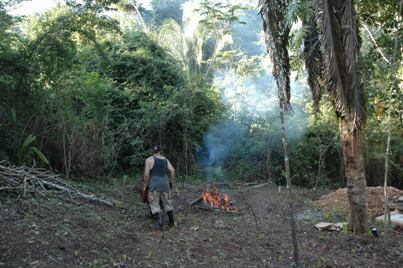 Most guys here are very very good at clearing (chopping with machete) and fast. The problem is that they can be ‘too good’ and cut valuable trees unnecessarily. You must clearly mark the area you wish to have cleared and visibly mark the trees you wish to keep. A good way to mark those trees is by tying white cloths around the trunk at eye level. Don’t just point them out, really mark them clearly! BURNING ~ Branches, leaves, and even trees are constantly falling throughout the year. Also, your garbage is in two categories; what you will burn and what you will take to the dump. For those reasons, your ‘burning’ area(s) is a permanent feature on your property and should be carefully selected. What to keep an eye on is that workers have a tendency of making piles too big, creating too large a fire. They also love using igniter fluids such as fuel or crude oil because it’s easier and faster! And finally, the best time to burn is at the end of the day when things are dry from the all day sun, but moisture will come soon (once the sun has set) and prevent the fire from remaining or spreading. CLEANLINESS OF WORK SITE ~ From the start, your work site can get pretty trashy. The work crew will just throw things (bent nails, used saw blades, empty containers or pretty much anything they deem as garbage) everywhere and don’t bother cleaning until the job is done, which is many months away. Be on that from the get go by providing trash cans and explain how easy and quick it is to clean up at the end of each day. Nearly everyone won’t like you at first for that, but as time goes, most will appreciate working in a clean site (especially if there’s a cold beer at the end of the day once in a while!). One major issue is non-burning garbage in the burning pile. I have picked up so many used circular saw blades in that pile! Even after several reminders, once in a while you will still find a metal can from a lunch box! Also provide broom and dust pan to clean sawdust in the house, and have a spare dust pan as they get lost, or break, easily! PLUMBING ~ Plumbing in Belize is quite simple, using standard PVC piping and accessories, which comes in schedule 40 or 60. Schedule 40, being the thickest one, is highly recommended as PVC will dry and become brittle over time. Also, all pipes that can be buried should be. When your worker is cleaning with the machete, those pipes can be vulnerable as they swing those machetes pretty hard! Also, if a tree or a rock fall, your pipes are protected. In this department, there are quite a lot of things to lookout for. ~ Many ‘plumbers’ don’t use the solvent before applying the glue. In one instance, a plumber dropped a fitting in the dirt after applying the glue, did not clean it and attached it to the pipe! ~ There are two types of PVC glue, one being for hot water pipes. They often will use the basic glue on all pipes. ~ They also are not big in the use of unions in strategic areas. They are a life saver when you need to clear a pipe or drain. ~ Vents on drain pipes are essential for proper drainage, and many guys don’t use them. ~ Another issue is ‘inclinations/grade’. Many guys have a hard time understanding the principle and your drain pipes might not be inclined enough or if at all. This problem of understanding inclinations is also an issue when doing gutters, shower tiles, roadways and ditches. 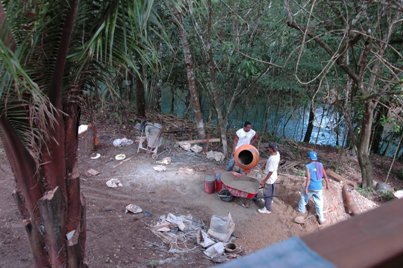 ELECTRICAL / WIRING ~ The custom in Belize, the Caribbean and Central America is to run wires outside walls and ceilings. So if you want your wires inside your walls and ceilings, don’t take it for granted and keep your eyes open. Unless you are totally 100% confident in your electrician, inspect all splicing as they often mix wire gauge and/or colors. Inspect all connections to outlets and switches as you will probably find some stray wires, unnattached ground wires, and loose screws. As for installing electrical hardware, I was amazed when our ‘electrician’ opened the box for the A/C unit and the first thing he did was trash the instruction/installation manual! Over time, I have found that it is standard practice not to follow, or trash, any instructions they find! 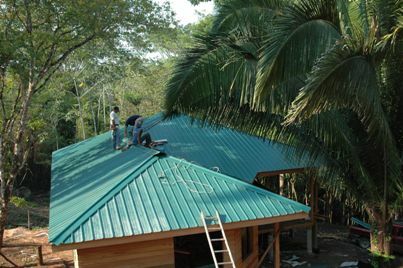 ROOF ~ Our roof is undulated metal sheets. Installing this type of roofing is quite simple and straight forward, but we did run into one problem. When installing the screws, which have rubber grommets for sealing, one guy was screwing them in so tight that the grommets would get crushed and split. This will sooner than later cause leaks. Once we saw that, we inspected each screw and ended up replacing a number of them. So this was part 1, and I hope some of those tips can come in handy for you! You can read my 2nd installment, which includes; Hardwood Coating (interior/exterior), Gutters & Drain Pipes, Tools & Equipment, Daily Inspection and, Paying the Workers & Contractors.